Are you tired of having to return screens to the screenroom to be remade because they didn’t work? You should be! 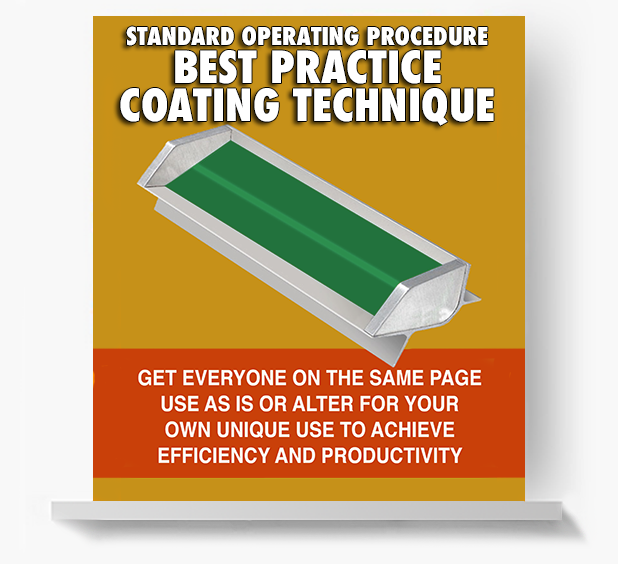 This Standard Operating Procedure for Best Practice Coating Technique is the tool that you need. Print it out and hang it in the coating area so that everyone knows exactly how to coat screens the right way. It is in PDF format for both Windows and Mac PCs. The PDF can be saved as a text document and altered to suit your specific and unique purposes. This Standard Operating Procedure for using best practices for coating mesh with direct liquid emulsion breaks the process down into 11 Steps, with 42 descriptive suggestions to help you achieve the best possible stencils in an efficient, effective and economical manner that will result in consistent, predictable, and reliable results. These Best Practice Steps are in use by tens of thousands highly successful screenmakers worldwide to produce outstanding results with every stencil made.